On June 29, 2012, the clock-tower on the Logan County courthouse was severely damaged by 70 mph wind gusts that twisted the tower on its base some 70 feet above the ground. While the clock-tower still stood after the storm, it was dismantled for safety reasons, leaving a hole in the Bellefontaine skyline for over two years. That hole was filled this past week when Midstate Contractors used a 350-foot boom to place the restored clock-tower to its rightful spot in the Logan County skyline. The renovations to both the clock-tower and courthouse are expected to be completed by spring. BELLEFONTAINE – After a two-year hiatus from the Bellefontaine skyline, the iconic Logan County courthouse clock-tower made its reappearance this past week. 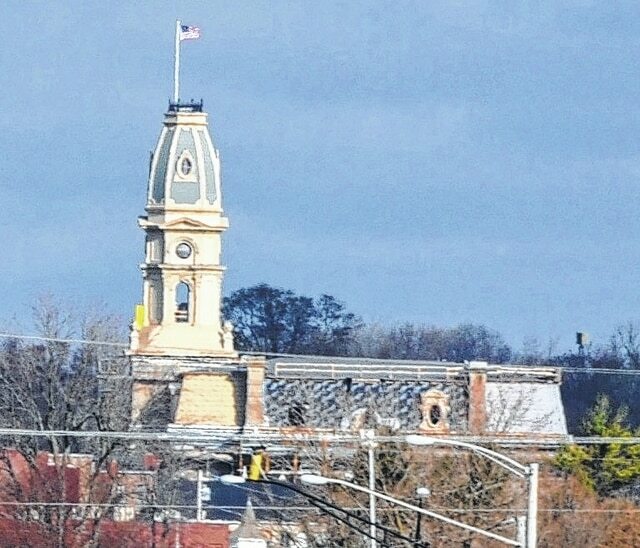 The courthouse with the distinctive clock-tower was erected in 1870 and was in continuous use until damaged during a storm on June 29, 2012, when 70 mph winds twisted the base of the clock-tower. The tower remained upright following the storm, but was disassembled for safety reasons. On further inspection, it was found that the courthouse’s 142-year-old roof was failing because of age, prompting a complete exodus from the building. The decision was made not to replace the courthouse, but restore it to its original glory, becoming the first county courthouse in Ohio’s history to receive such treatment. The total bill for the reconstruction comes to just under $8 million, which includes the tower renovation, roof repair and updates to courtrooms and offices. Midstate Contractors, general contractor for the restoration, moved a 350-foot boom into downtown Bellefontaine and on Tuesday, Nov. 10, put the topper on the 142-foot-tall structure – the heaviest section weighed in at over 8 tons – which itself was topped by a 25-foot flagpole with Old Glory catching the breeze some 55 yards above Main Street. Midstate Contractors kept the courthouse’s plans and used materials for the exterior similar to those used 140 years ago, but updated the inside with steel-beam framework and concrete foundations reported to be able to withstand 120 mph gusts. The work on the clock-tower and courthouse itself is expected to be completed in the spring of 2016.
https://www.urbanacitizen.com/wp-content/uploads/sites/36/2015/11/web1_DSC_0007.jpgOn June 29, 2012, the clock-tower on the Logan County courthouse was severely damaged by 70 mph wind gusts that twisted the tower on its base some 70 feet above the ground. While the clock-tower still stood after the storm, it was dismantled for safety reasons, leaving a hole in the Bellefontaine skyline for over two years. That hole was filled this past week when Midstate Contractors used a 350-foot boom to place the restored clock-tower to its rightful spot in the Logan County skyline. The renovations to both the clock-tower and courthouse are expected to be completed by spring.